Illinois State alumna Allison Zale works with a fellow member of the NSF's Research Experiences for Undergraduates team on a math problem. Huddling into groups, men and women poured over sheets of intricate numbers and graphs. Red, black, and green marks cover a wall-length Dri-Erase board, slathered with a series of lines, dots, and equations. Eyes focused, they grappled to find the answers that elude them. This is math. And to this collection of teachers, and soon-to-be-teachers, it is a way to seek the truth. Each summer since 2007, Illinois State University has been home to one of the National Science Foundation’s Research Experiences for Undergraduates (REU) sites. The eight-week program allows high school teachers, as well as those studying to be teachers, the chance to do mathematical research. “Math is a dynamic endeavor. The research we do is similar in nature to chemistry and physics. We want to find out how things work,” said Illinois State’s Distinguished Professor of Mathematics Saad El-Zanati, who co-organizes the REU program every year. 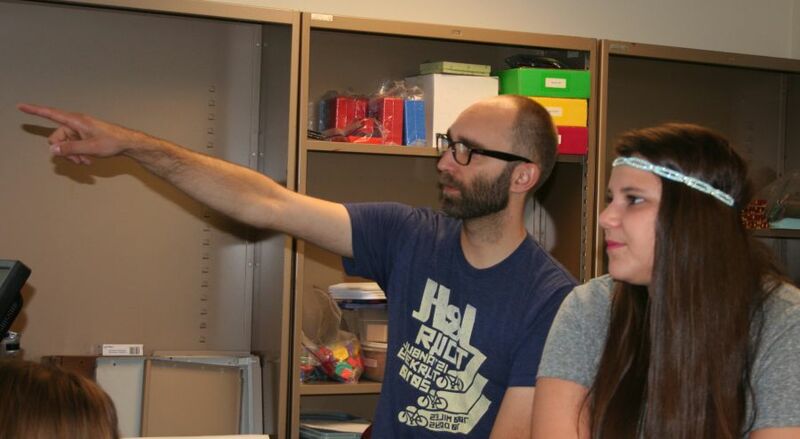 Though there are around 50 REU sites across the country dedicated to mathematics, Illinois State’s program is the only one to work with both pre-service and in-service teachers. “Our goal in doing authentic mathematical research is to translate it into the teaching experience,” said El-Zanati. This year’s program drew participants from as far away as Puerto Rico, Georgia and Southern California, while some were a little closer to home. REU participant Laban Cross has been teaching for 11 years in nearby Tri-Valley schools. “Being here, doing research, it helps rejuvenate me, and I can bring that excitement back to the classroom,” said Cross, an Illinois State alumnus who earned a master’s in 2008 and his Ph.D. in 2013. Cecelia Koshela and teacher Erik Pelttari discuss a math problem. Illinois State’s REU program focuses on researching mathematical concepts and finding solutions. This summer’s REU has been dedicated to graph theory—or using graphs to understand the relationship between structures. Research from the program generally results in publications in national mathematics journals and presentations at national conferences. In a room in Stevenson Hall, REU participants studied a series of problems. Allison Zale sat with her head bent over a math problem, and sighed. Sitting next to her, Esther Song’s head popped up. “Don’t tell me it doesn’t work,” said Song. “It doesn’t work,” said Zale. 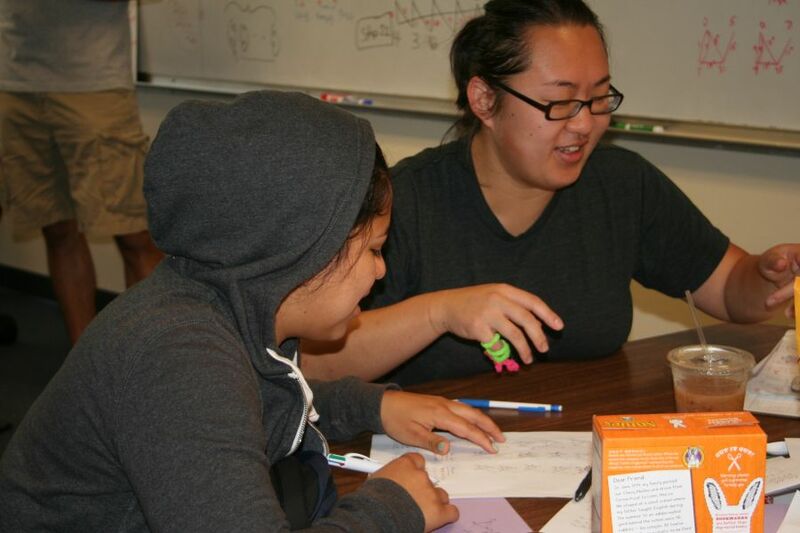 Student Jacqueline Guadarrama (left) and teacher Esther Song work in the NSF research program. Song rolled her eyes. “Give it to me,” she said, her voice resigned. Zale’s thoughts were interrupted by Song, a teacher at Lindblom Math and Science Academy in Chicago, who jumped up and burst into song, the offending math problem aloft in her hands. Throughout the REU program, research is punctuated by opportunities to work with University faculty and students as well. Participants plan a math camp for high school students from Chicago’s inner-city schools. Held at Illinois State each summer, the Mathematic Research Academy gives the REU class a chance to mentor.